Bayern Munich boss Pep Guardiola says he will still be at the club next season, despite reported interest from Manchester City. Guardiola was asked about his future at the pre-match news conference for Tuesday's Champions League semi-final second leg against Barcelona. "I've already said 200 million times - I'll be here next season. That's it," the ex-Barca boss, 44, said. "I have a year left on my contract. Next season I will be here." City boss Manuel Pellegrini could be under pressure after his side lost their Premier League title to Chelsea this season. 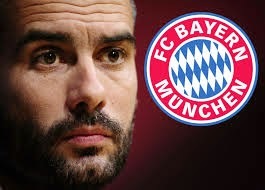 Newspaper reports on Sunday morning claimed that Guardiola, who is in his second season in charge at Bayern, had reached a verbal agreement to manage them next term. He has won a domestic league title in five of his six seasons as a manager, three with Barcelona and two with Bayern. This is also his fifth season managing in the Champions League semi-finals. However Bayern face a big task to reach the final, having lost 3-0 in the first leg of their tie with Barca. Guardiola said: "Barcelona are strong on the break. If we let something slip, they'll punish us. "We have to defend well. We can't go on the all-out attack. We have to control the game. "We're Bayern - before a game I've never said that we have no chance. Of course we do."